The weekend is almost here! Normally I would be excited because I don't have to work on Saturday, but because my in-laws are in town, I'm going in to work just to get a break from them! I finally received my Zoya 2013 special order recently and have one of the PixieDust polishes to show you, called Chyna, which is a ruby red jelly glitter. I ordered this so long ago I forgot it was in there! I was curious about this line of Zoyas and wanted to see what made them unique. I found the formula to be super easy and smooth to apply but unfortunately it felt like forever to dry. It dries to a matte jelly finish which means there is still some shine due to the jelly base but has a slight matte appearance to it. The glitters give it a rough appearance and the overall look reminds me of sugar rock candy, or maybe wet red sour patch kids. I used two layers for this mani except my pinky which I smudged and used a third layer - that one is still wet and drying but it seems like I applied it forever ago! I like the lighter shade of the red after two layers but because a third layer makes the red darker, VNL is less visible. Here it is with a layer of Gelous which it ate up quickly and a layer of SH Insta Dri. 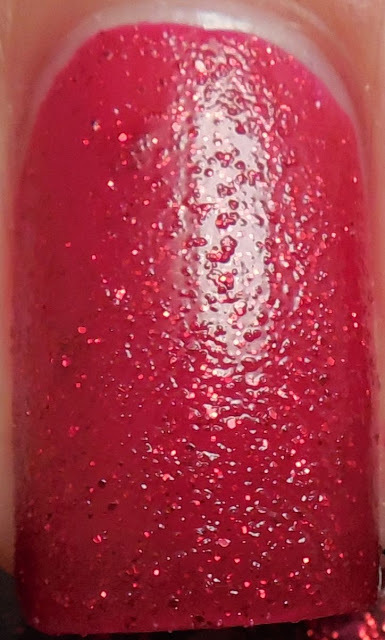 It's pretty like this, and reminds me of one of the regular red jelly glitters like China Glaze Ruby Red Pumps, Essie Leading Lady, or Butter London Chancer. Overall not a fan of this polish and if the rest of the PixieDust polishes are similar, I'll be passing on these altogether. Even though it's pretty with a topcoat finish, I'd rather have another brand's jelly glitter to save myself from having to use a layer of Gelous! What do you think of these, do you like the finish or will you passing on these as well?